I'm not a big fan of maps that are almost complete darkness, but this one has a nice layout, (though it is quite a long trip to any of the other bases from your own). 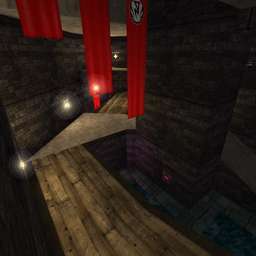 Not one of my favourite CTFM maps anyhow but it's still ok.
Where the hell can i find No tansc pack? Note:Maybe you should put this Package with winzip! uh, woops - sorry must've forgot to put it in the zip I uploaded here. I'll try remember to upload a new version. For now try going to http://furpile.com and doing an advanced search for "NoTransloc". You should be able to get the package from there. I'd thought I'd vote this back up a bit (compensating for the bogus 0). A very solid, rather large Multi map-central area not too interesting but the bases have some surprises and overall it flows well. Probably about a 6.5 if I wasn't rectifying injustices.